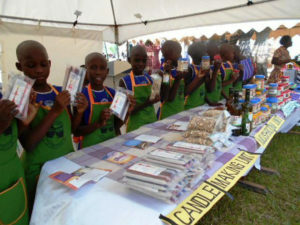 Pupils show how candles are made at a past Agriculture Show exhibition. Courtesy photo. Subsistence agriculture practiced by the majority of Ugandans has greatly hindered the country’s agricultural potential President Museveni has said. “On top of having many people engaged in subsistence agriculture even those who attempt commercial agriculture tend to fail on enterprise selection and end up practicing non-profit oriented agriculture,” President Museveni said. He called for countrywide sensitization of farmers about the need to embrace commercial agriculture in order to fight food scarcity in the country. “Political leaders should sensitize the population to do commercial profit-oriented agriculture to guarantee food and income security otherwise you are committing political suicide by keeping around you a hungry and poor population,” he warned. He castigated leaders over failure to educate the population about the benefits of modern agriculture practices. The President commended Ugandan researchers for developing quick-maturing, high yielding and drought resistant seedlings and advised farmers to make use of the seedlings to improve agriculture productivity. The President also urged the population to conserve the environment, urging that environmental conservation is the bedrock of meaningful agriculture. “We can’t talk about agriculture without talking about the environment. Even if we are to irrigate our gardens, we need water but where shall we get the water from when we have destroyed all our water catchment areas leading to loss of rain,” the President stressed. He also assured farmers that his government is committed to controlling ticks and east coast fever through vaccination that will soon be carried out. 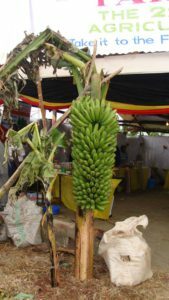 A banana plant at the Show grounds. Courtesy photo. The Minister of Agriculture, Animal Industry and Fisheries, Vincent Bamulangaki Sempijja, said the Jinja agricultural exhibition is focused at show-casing new and modern agricultural practices, special packages for the youth, women as well as financial institutions. Jinja Municipality West MP Moses Balyeku appealed to farmers in Busoga sub-region to use the Agriculture Show as an opportunity to learn the best farming practices so that they can improve agriculture productivity. 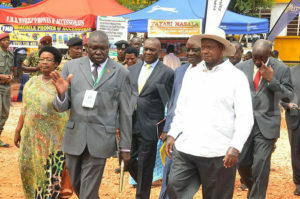 The National Agricutural and Trade Show started in 1993, near the source of the Nile at Jinja. The show provides a platform for displaying and identifying innovations made by local and foreign companies through improved technologies for better production, marketing and poverty eradication..